During yesterday's MLB Trade Deadline coverage, ESPN, powerhouse muti-tiered sports entertainment company had seemingly all the bases covered. They had their trade deadline blog with terminally plugged-in reports from Jayson Stark and Buster Olney pumping out information all day, plus their additional on-the-ground baseball writers, and ESPN News hosting a three-hour live segment fronted by Linda Cohn with a rotating cast of MLB experts and regional reporters calling in with on-the-scene reports from the supposedly big buyers and sellers. There was a little countdown clock in the bottom of the screen, right above the scroll, to give the impression that come 4 p.m., ESPN will be there to break the news first and then have an army of talking heads to dissect it. 4 p.m. came and went without a last minute blockbuster. Then, like the majority of the baseball media community, they still got scooped. Not even ESPNdeportes could help them. At approximately 4:12 p.m., Linda Cohn was frantically shuffling through papers on her desk until she got the one she had to read: Manny Ramirez traded to Dodgers details to follow... Cohn looked like she the paper she was reading off of was covered in vomit, as now, after three hours of wall-to-wall coverage with some of the most entrenched baseball writers in the country sitting next to her (including a visibly annoyed Peter Gammons video conferencing from what appeared to be a library in an elementary school) she was alone. It wasn't her fault, but there is a question as to how so many of the big media people got so blind-sided by this trade? Did SI's Jon Heyman just make one more phone call past deadline to make sure? Did he have better sources? Actually, to be fair, Boston Globe writers Gordon Edes and Nick Cafardo, appearing on NESN, announced the trade about twenty minutes before Heyman did, according to one reader. Worse than ESPN's on-air and on-line boners were MLB.com, whose last two reports at the end of their day of wire-to-wire blogging were about the long-dead Jason Bay-to-Devil Rays deal then, curiously, "Bay To Dodgers?" at about 4:04. Considering how evolved the world of media is supposed to be at this point, it was an amazing occurrence that knocked so many of the big boys back to the teletype age, reduced to piggy-backing off of each other through most of the day. It's especially odd given that so many of the experts and trade deadline hawks were given assurances that something last-last minute could conceivably happen. But why wasn't everyone looking at the Red Sox come 2:45 p.m., when the Dodgers supposedly swooped in to make the deal, to triple-check to see if something was still afoot? It was odd. Yet, ESPN.com, of course, still had the gall to use the phrase "first reported by Amy K. Nelson" until they finally removed it earlier in the evening. 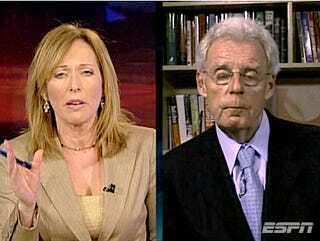 Maybe they were giving Nelson credit for handing Jon Heyman's report to Linda Cohn?